Sometimes I feel really good to have a vegan dish especially when I have had enough meat. 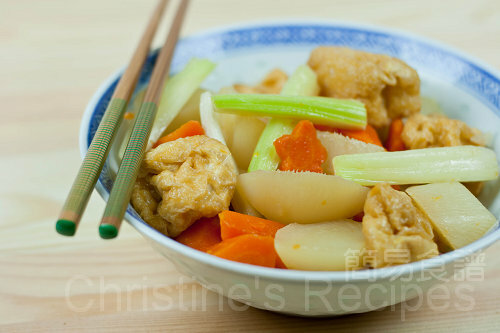 This Stewed Beancurd Puffs with Daikon and Carrot that I created last night was a bit like Japanese dish. Daikon has a natural sweetness which is often used in Japanese cuisine. However, I do like to incorporate it in my Chinese cooking as well. The dish I cooked last night was very simple. 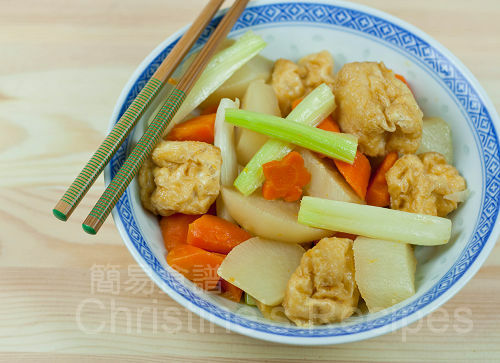 I just used a red carrot and some beancurd puffs to cook with daikon in stock. The daikon was very tender and absorbed all the flavours in it, very delicious! Rinse beancurd puffs slightly. Blanch in boiling water for 3 minutes to remove oil. Turn occasionally. Drain well and squeeze excess water. Set aside. Julienne celery and stir fry over medium heat with a little oil until tender. Set aside. Peel and cut daikon on the diagonal. Then roll the daikon a quarter-turn, and cut straight down again at the same diagonal angle. Continue rolling and cutting in this way all along the length of the diagonal. Follow the same method to cut carrot. Heat 2 tablespoons of oil in wok or frying pan to saute ginger slices until aromatic. Add the daikon and carrot, then pour in seasoning and bring to a boil. Reduce heat and stew till ingredients tender. 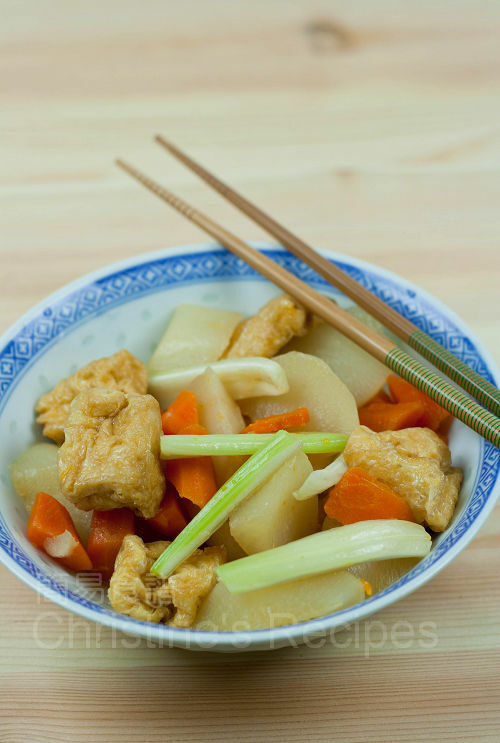 Add beancurd puffs, then continue to stew until flavoured and sauce thickens. Stir in celery. Dish up and server hot. Yummylicious, nice post I'm try this one. I let my wife cook for me. This looks like a perfect dinner. I have never had bean curd puffs before. Can they be made at home? What a great and healthy meal..great recipe!! I would love to try the bean curd puffs - this looks like such a delicious preparation! Oooh Christine - I've been eating way too much lately. I need to start eating healthy yet delicious dishes like this one! So healthy and light! Perfect one-dish meal! Those beancurd puffs look so light and fluffy. Great, healthy meal! I always use daikon in Chinese cooking - esp soups! I've heard that the daikon in Fall is ginseng :O ....daikon has nutritional and healing benefits too.